These innovative chillers allow you to enjoy wines by the glass at their ideal sipping temperatures. Rather than drag out the ice bucket whenever you'd like to enjoy a little vino, Steven Chavez and Justin English's innovative set of four chillers allow you to enjoy wines by the glass at their ideal sipping temperatures. Simply freeze this set of four sleek, stainless steel orbs, pour a glass, then drop a few into your wine. Like ice cubes, the more "pearls" you use, the more frosty your beverage will get. The sophisticated, oval shape of the chillers is ideal for round-bottomed glasses, since the glimmering spheres will pile up elegantly in the bowl after they're plinked in one at a time. While vino aficionados wouldn't dare serve a white wine at room temperature, it's also important to give red wines the same consideration. When reds are served too warm, the alcohol tends to predominate, concealing the fruit of the wine and resulting in a loss of typicity and personality. Fortunately, when you pop a wine pearl into a room-temperature pour of red wine, you can bring it down to cellar temperature (54–64º F/12–16º C) in a matter of minutes. 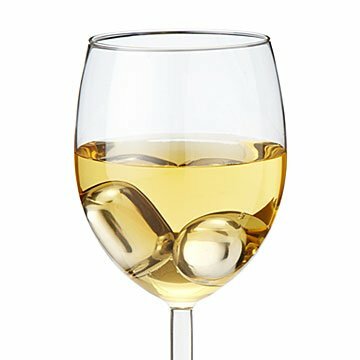 While these pearls are perfect for wine, their ability to chill without altering or diluting delicate flavors also makes them ideal for cooling top-shelf liquors, delicate cocktails, and fresh fruit juices. Made in China. About 80% of all soapstone quarried is deemed waste or scrap material. In an effort to regain control of this waste and turn it into something useful, Steven Chavez and Justin English set out to clean up the quarries and find a purpose for the discarded stone. Soapstone is one of the most effective natural materials on earth for conducting and retaining temperature, so Steven and Justin turned to these natural properties to handcraft a beautiful line of soapstone kitchen and barware. They've recently expanded into stainless steel, bringing the same level of sophisticated design and utility to entertaining ware. Their company is based in Denver, where the majority of the products are handcrafted. Pearls will bring a 4 oz. of red wine to 60 degrees and will keep champagne and white wine chilled. Keeps wine chilled for approximately 30 minutes. Great in theory, don't seem to chill very well or very long. Was disappointed that they seem to have little ability to really chill the glass (unless you use all 4 at once) and quickly lose their cold, so the drink doesn't stay cool long. Thought these would be a bit better performing than regular ice. The pro is that they don't water down the drink. But you definitely need your drink to start out cold for these to work best. Few others have this product. Such a great idea and product, I got it for my mom too. Love how it's geared toward wine versus whiskey stones. Can't find this in stores, I tried. I bought these wine pearls for my boyfriend, which who saying loves wine, is an understatement. We had been using ice cubes to cool our wine when I came across these gorgeous wine pearls. Unfortunately the pearls look better than they work. They just do not cool well. The sips of liquid touching the pearls were cool, leaving the rest of the liquid warm, so that when I took a gulp, my mouth was greeted with an unpleasant mixture of cold wine and very warm wine. In the end, we'll just stick to ice cubes. Awesome product. Simple yet helpful. No more watered down wine or drinks. Don't always have to use it for wine either works really in any drink! This is the perfect gift for any wine lover! Gift great. Packaging not so much! Keep wine cold without ice melt. I would NOT buy more of these wine pearls. Did not work . Doesn't last. Chilling last about a minute.